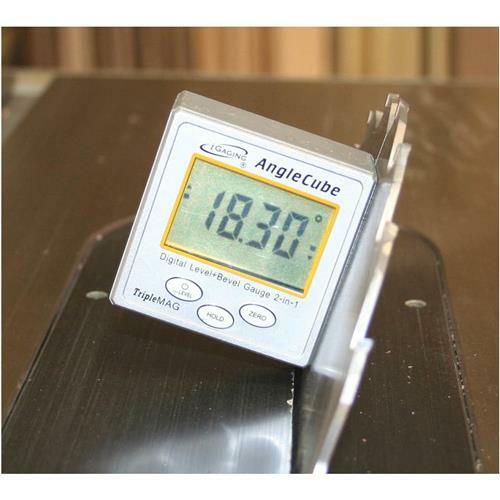 This Angle Cube 2" Digital Level/Bevel features a super large reversible LCD display, CNC machined aluminum body with chrome finish and strong magnets on both sides and bottom. Just got around to using it yesterday and everything seems fine. The unit seems to be as accurate as any other Ive used. Checked it on the saw with a square qualified to .001 of square and it read correctly. I set my stops on my TS with squares I know to be true and use the angle cube for everything in between. 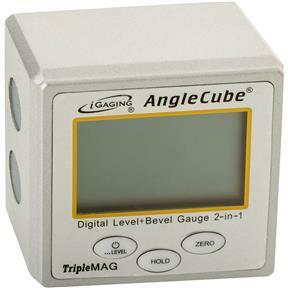 Students in my woodshop classes find it much easier to insure proper cut angles and joint fits with this digital bevel. Now all my saws give accurate cuts cuz the blades are where directed. I like accurate cuts. I bought this as an attachment to my milling machine head so I can keep it square, or at any other angle I want to the bed...works like a charm. I have gotten these before and they work great. They do not use the coin type batteries and use AAA batteries. The only thing I wish they would add is a V grove on one side with magnets for round stock. I have used this to verify the angle of the blade to improve my ability to make larger boxes.